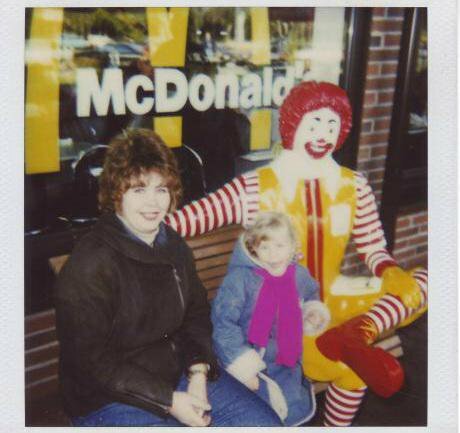 Artifact of the 90s: a visit to McDonald's captured on Polaroid. Image from the personal archive of Olga Ostapova, courtesy of Dmitry Okrest. Check out the latest in our Unlikely Media series, which profiles independent (and independently-minded) publications from across the post-Soviet space. As part of this series, we interview editors who are trying to make space for alternative journalism, political commentary and reporting. Here, Dmitry Okrest, Stanislav Kuvaldin and Evgeny Buzev speak about their new book, It fell apart: Everyday life in the Soviet Union and Russia, 1985-1999, which traces forgotten moments of the 1990s — how people switched to the market economy, the Russian and Ukrainian miners strikes, the growth of radical movements and the legacy of Soviet dissidents. Specifically, we deal with memories of Russia’s experience of the 1990s, the retroactive politicisation of this time and what the future holds for the “wild decade”. The book is based on your VKontakte group “It fell apart”, which was set up in June 2014. Could you tell us what led you to start this group? What role did it play when it come to financing the actual book? Dmitry Okrest: It’s worth noting that our VK group came about as a platform to share photos and videos on the theme of the Soviet collapse. 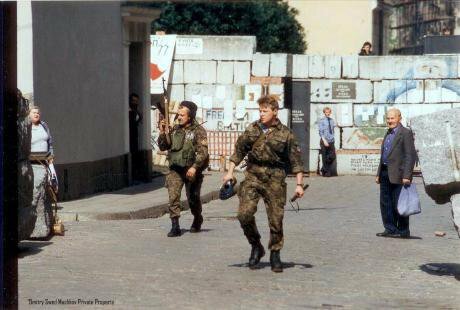 EuroMaidan, the “Russian spring”, Crimea, the 2 May fire in Odessa, the start of the Anti-Terrorist Operation — all these events reminded strongly us of how events started in the Caucasus, Transnistria and Central Asia in the early 1990s. And judging that we now have over 200,000 people signed up to our groups, they didn’t remind just us. Evgeny Buzev: Crowdfunding didn’t play a decisive role in publishing our book. We collected funds rather slowly, but because we started the process ourselves, a lot of people found out about our plans to publish and became interested. This is how we came into contact with our publisher, the University of Dmitry Pozharsky. Crowdfunding is, at minimum, a good advertising move. Moving on to the subject of the book itself, what differences do you see between the reality of the 1990s and the way people remember it now? What future do you see for the memory of the 1990s? Dmitry: It’s natural for people to distort reality, their memories and images that they make for themselves — whether by themselves or thanks to the media. I encountered this right from the start: I was preparing to collect material and I was asking people who were involved in things more than 30 years ago — from cooperative trade to civic activity. For most, this is a time when they were young, full of energy and that’s why many things have faded, and others – have only grown stronger. I paid attention to this particular form of perception when I was taking interviews for the book. For instance, there are interesting differences between what one figure says now, and what he said in interviews to journalists 20 years ago directly after the events in question. The same thing happens with collective memory — on the one hand, people demonise the “wild 1990s”, and on the other, there’s a certain idolisation of the “era of freedom”. Stanislav Kuvaldin: The articles I produced for the book are largely based on the press of the time. While I was working on it, I studied a lot of newspapers. Strictly speaking, it’s difficult to talk of the 90s as a single, united decade. The public mood, the limits of the permissable and the general line of the press both before and after the 1993 Constitutional Crisis, the First Chechen War, the 1996 presidential elections and the 1998 default were quite different. The 90s is, in fact, several epochs, which people now united into one. With the 1990s encompassing so many events, it's hard to find a single symbol for the epoch. I used to take some newspaper articles and post them on my Facebook page, just for fun. I can say that practically all of them provoked a small storm of emotions. People began to discuss this or that, argue, remember things. Indeed, it seems to me that these posts caused such emotion precisely because the language of those years has gone, as have the media’s ways of evaluating various situations. People perceive the words “government”, “president”, “state” and others very differently now. So in that sense, people really don’t remember something important from the 1990s, they can’t remember in detail how they thought and felt back then, even though they might read the same newspapers still. Evgeny: Today, there’s no unified memory of the 90s. There’s no consensus in Russian society about that period of history, although there isn’t for practically all periods. Historical memory is often replaced by political slogans. By hearing just a single phrase about any given element of the 1990s, you can guess what someone thinks about the whole period. I don’t think that this situation will change anytime soon. You can see the parallels with Stalinism. Seventy years have passed since the death of Stalin, but his rule and his personality still provoke discussions, which often, it should be said, don’t address the past, but the present. I think the 90s are going to generate artificial memories for a long time — memories that don’t come from real experience, but are guided by people’s political views. You’ve previously talked about a certain sense of nostalgia you felt during EuroMaidan and afterwards — watching the news during those days reminded you of your childhood, the events of the 1990s — and this pushed you towards making a space to share pictures and information from that time. There’s a lot to be said about the role of nostalgia, the myth of the 1990s in Russia today as an important part of the “stability” paradigm promoted by the Kremlin. It seems here that you see the upheaval characteristic of that time as your home, your childhood. What does it mean for you to study the 1990s, to engage with others from your generation? Dmitry: For me, this epoch is all about the new cemeteries that had to be built for the mafia, the dominance of Disney over Soviet cartoons, scare stories about Roma and sect members looking to steal your apartment, TV soaps about gay men in love and the Dolls satire show, which used to poke fun at the Russian government. When I was preparing the promo video for the book, I was surprised how many things from back then are impossible to imagine being public today. Several people who watched it then said that, over those two minutes, they saw their whole childhood. I think the images used there are memorable for many people. Stanislav: For me the 1990s aren’t quite childhood, they’re the last classes of high school and then studying at Moscow State University. So, for me, researching this time carries quite a few emotions with it. First of all, I should probably say that I wasn’t a fan of what was happening around me at the time, I wasn’t prepared to accept the regime of time whatsoever, and in 1996 I voted for Gennady Zyuganov, the Communist Party candidate. 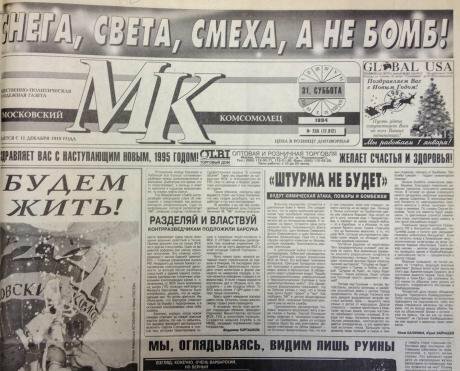 Moscow Komsomolets was one of the most popular newspapers of the 1990s. Today, it's known for its tabloid views. Image courtesy of Dmitry Okrest. The meaning of the 1990s became clear later. And it’s unlikely this was connected with the usual idealisation of youth. I suspect I missed the “rarefied atmosphere” of those years — that is, the lack of pressure (in many forms) from the authorities, various bans on public activity. Nevertheless, when people just “forgot” about the authorities, this led to different behaviour, people began to have different ideas about what was possible, what was permissible. I don’t want to see these phenomena in a purely positive light, but I can say that, for me, something of that time is lacking today. Evgeny: In terms of the 1990s, then they are definitely part of the paradigm of stability — only they’re not connected to nostalgia, but the opposite, state propaganda uses the image of the 90s as an antithesis to the situation today. For me personally, this decade coincided with growing up — I finished high school in 1999. I have a lot of personal memories that illustrate the epoch for me, even more so as I lived in the Far East back then, which experienced a lot of changes back then. I remember the sudden blackouts and problems with heating in winter. But the majority of my memories aren’t about political upheaval, of course, but what people usually remember about school, friendship, love and so on. Many of my friends, and me, see how our generation is different from people who were born 10-15 years before. They are completely different people, who seem far more calm and naive than us. Though maybe this is just the start of my old age grumbling, and not the portrait of a generation. There’s a lot of discussion about the role of nostalgia in Russia today, the Stalin cult (the Levada Center recently found “respect” for Stalin at a 16 year high), “Soviet mentality” — often in pejorative or negative terms. Part of the lasting appeal of Stalin (in addition to the state’s manipulation of public memory) seems to be related to the fact that the 1930s-1950s is a key moment of Russo-Soviet modernity. Factories were built, infrastructure, grand projects, and, of course, the crowning moment of the Soviet Union – the war. But if the 1930s-1950s are often thought of as the construction of modernity, then the 1990s are about the destruction of that modernity, the transition into something else. How do you see your generation’s experience and idea of the 1990s in comparison to other generations? Is this a source of tension? Dmitry: You’re right that the 1990s were a transition into “something else”. And it seems to me, that it’s still hard for people to reflect what that “something else” is. People’s positions today are still connected to what they did in the 1980s and 1990s, which means that the time for unbiased judgement still hasn’t come. Stanislav: It seems to me that while the current regime remains more or less stable, the 1990s could occupy a similar place in public consciousness as the New Economic Plan period did for the Soviet Union. That is, a short, bright period, which was then destroyed by ensuing repression. A period that saw many forms of freedom — economic and cultural, which now appear impossible. Soviet propaganda often condemned many things connected to NEP — the focus on individual gain, the fall in moral standards — but couldn’t exclude it completely, given that Lenin himself announced the NEP. That’s why, despite the official condemnation, some nostalgic memories of that time (which was unlike the entire epoch that followed it) began to be permitted. "Blessing 2000" in St Petersburg. Image from the personal archive of Petr Skutin, courtesy of Dmitry Okrest. Nowadays, it’s impossible for the 1990s to be completely denied, despite all the criticism of that “wild” time — not least of all because Putin is the successor to Boris Yeltsin. This is why the memory of this epoch will continue to be maintained, even romanticised, unconsciously and unofficially. How would you compare this dynamic with other countries experiencing a wave of cultural insecurity, for example, the UK or the US? Evgeny: It’s hard to draw parallels without digging deep into the cultural and historical context. But, as far as I can judge, the image of the 1990s in the US and the UK is quite different from the post-Soviet space. The epoch of John Major and Bill Clinton is very distant from what happened in our country. The realities of America (and, to a lesser extent, Europe) were a utopian place for part of Russian society during the 1990s (and remain that way for some people today). Stanislav: For the US, I think the 1990s were the peak of its power — when the Cold War finished in the best way possible for them, and it seemed that the world would be, at last, built in the best way possible. Perhaps I’m wrong, but it seems to me that, for America, the 1990s were a time of euphoria and confidence in their own strength. Dome Square, Riga. Image from personal archive of Dmitry Mashkov, courtesy of Dmitry Okrest.Certain forms of discomfort and unease, which manifested themselves in the anti-globalisation demonstrations or books such as Generation X and Fight Club, were connected to a desire not to be a part of this new order, which seemed, on the whole, unbreakable. These emotions, it seems to me, are less like those that the average resident of the post-Soviet space felt during the 90s. But, as before, I’m judging the situation from the outside. Looking through the book, it’s intriguing to see so many stories from other parts of the Soviet Union — Armenia, Azerbaijan, Georgia, Lithuania. For us at oDR, we’re deeply interested in what happens in these countries, and, with all the attention to local specificities, we often see clearly comparable situations in the realm of politics, social welfare, rule of law, corruption, media and so on. 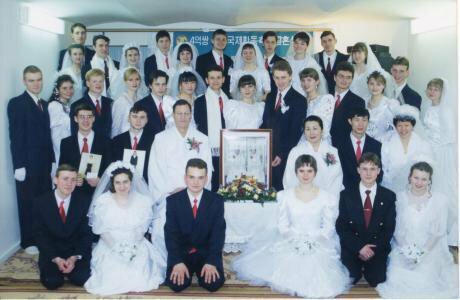 It seems to me that this interest in other parts of the Soviet empire is rare among the younger generation in Russia. That the late 1980s and 1990s were not just a reorientation towards free-market democracy as the stated goal of transformation, but the emergence of the national as the main point of reference. How would you evaluate the interest of your public’s users to other countries of the former USSR? How does their interest relate to the population at large? Dmitry: According to independent booksellers such as Falanster and http://primuzee.ru/http://primuzee.ru/, the first copies have sold quickly. In the central Moscow bookshop, the book was number four on the list of historical books. And the online seller Ozon marked it as a bestseller. A quarter of the book is dedicated to former Soviet republics — the standoff between OMON riot police and new authorities in Latvia and Lithuania, the student Maidan in Ukraine, miners’ protests and the rise of far-right in Ukraine, Armenian refugees in Azerbaijan, the civil wars in Georgia and Tajikistan. The statistics for our online community show that a significant number of our subscribers are young people born after the fall of the USSR. And today, the main driver of foreign news on Russian TV is Ukraine, there are large numbers of labour migrants from Ukraine and Central Asia — people in Russia are interested in understanding who these people are and what links them to Russia. Evgeny: The interest is high, but it’s often connected to certain aspects of history of other post-Soviet states — conflicts and coups. Today’s generation knows nothing about these events, they are hardly covered in school history classes, and don’t have a place in mass culture. And for them, these events are a kind of Game of Thrones, the end of which is unknown, and whose main characters emerge in the course of the story. At the same time, Russian people are apathetic towards many, even the most prominent events involving culture or politics in their own country. But we do have a significant audience from other post-Soviet states. We can also pick out Ukraine as a special example: for Russian readers and internet users, there’s additional interest in what’s happened there since the events of 2014. Dmitry Okrest is a correspondent for RBC, and works with GQ, New Times and Snob. He writes about the Middle East, political extremism and the justice system. Evgeny Buzev is a journalist and social media editor. He works with Snob, FurFur, OVD-Info and other platforms. He has invented dozens of online communities, and will continue to do so. Stanislav Kuvaldin is a historian and journalist. He finished Moscow State University and has a PhD in history. He has a number of academic publications on recent history in Poland, and currently works for Republic. he is also an expert for the Russian International Affairs Council.